Time for another installment of CSA Cooking, where I write about how I’ve used, prepped, eaten, or preserved items from my monthly Philly Foodworks rolling farm share. Use the code FOODINJARS to get $10 off your first Philly Foodworks order. I didn’t manage to take a group picture of all that came in my share this month. However, the box was a season-spanning collection of fruits and vegetables. I got sweet potatoes, garlic, a hefty eggplant, a small of kale, a big red bell pepper, a quart of plums, and a giant head of curly endive. Heating soup leftovers on the second night. The original batch was far larger. There was so much of the curly endive that it made an appearance in two different dishes. 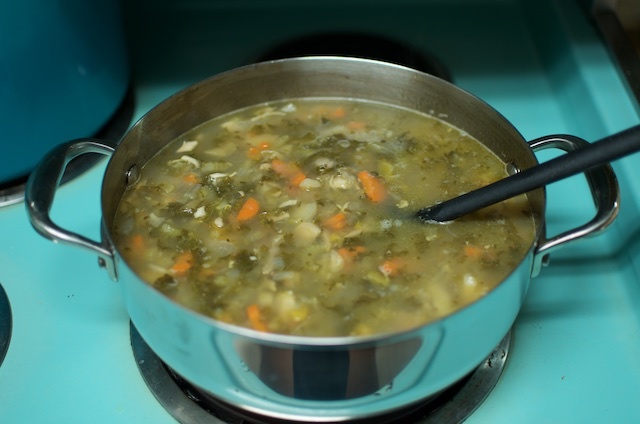 The first was a pot of chicken soup that stretched across four days, two dinners, a breakfast, and a lunch (when it’s available, I do love a warm bowl of soup for breakfast). The soup was made using my standard technique. I pulled the meat off leftover chicken, piled the bones in a pot, added vegetables, and made stock (this time, I used a pressure cooker, which was amazingly speedy). I sauteed chopped onions, carrots, celery, parsnips, and garlic in some olive oil, added the roughly chopped greens, poured the hot stock over the top, and stirred in the leftover chicken. Seasoned with salt, pepper, a little Better than Bouillon (to round out the chicken-y flavor), a couple tablespoons of vinegar, and a splash of soy sauce for depth, it was done when the carrots were tender. As with all soups, it was good the first night, but far better the second and third days. The second curly endive dish was based on one I ate while in Pittsburgh a couple of weeks ago. My friend Cindy lives near an Italian place called Legends of the North Shore that is particularly well-known for their beans and greens (they also sell them out of a food truck). We ordered a small spread from Legends the first night I was in town, and I so loved that dish that I dug around online until I found a recipe that the chef had shared with their local CBS affiliate. What’s so interesting about this dish is that it doesn’t actually depend on traditional cooking greens they way you might think. Instead, it uses spring mix, chopped romaine, and spinach. Adapting it to my needs, I made my version with the other half of the curly endive, one romaine heart, and the very end of a bag of baby arugula. This is going to be my approach from now on when I have an abundance of salad greens that need to be used, because it is fantastic. 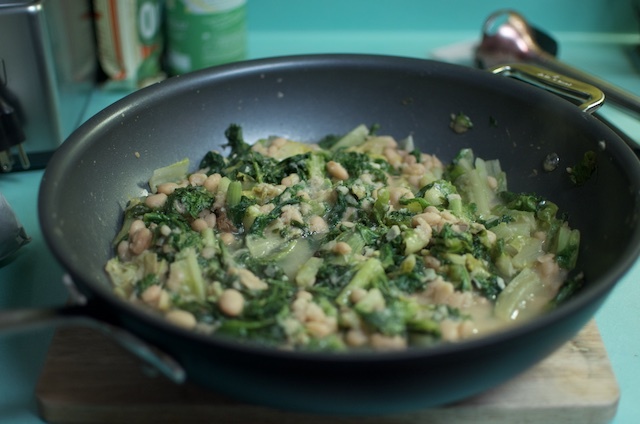 Essentially, you heat a bit more olive oil than feels reasonable and heap your greens into the pan. While they wilt, you mince/press/grate several cloves of garlic, rinse off some white beans (I used a jar of these), and measure out a little grated parmesan or pecorino. Once the greens have wilted, you add the garlic, beans, cheese, and a splash of water or broth. With just a couple stirs, the cheese melts and the liquid in the pan magically transforms into a lush, creamy sauce. Salt and pepper to taste and you’re done. We ate our beans and greens alongside some scallops, but you could easily turn this into the main event by tossing in some pasta or a bit of cooked and crumbled sausage. I can already tell, this is a dish that is going to be in heavy rotation this winter. Heat the oil in a large skillet over high heat until it shimmers and then heap the greens into the pan. Put a lid on the pan to help the greens wilt a little. After 2 to 3 minutes of cooking, check to see if the greens have wilted. If so, add the garlic, beans, and cheese and stir to combine. Add a 2-3 tablespoons of water and cook for another minute or two, until the greens are tender and the liquid in the pan has coalesced into a creamy sauce. Add the lemon juice, a little salt, and 6 or 7 turns of a pepper grinder. Taste and adjust the seasonings until you're pleased. Thank you for sharing this recipe! I love the idea and will definitely be working it into rotation. I can not wait to try the endive, beans and garlic (for which I will use quite a lot!) recipe! I live very far from Philly, but am there vicariously through you and very happy to hear all that is going on there. My mom was born in Philly and I grew up in South Jersey. I still have a lot of family in the area, but haven’t been in several years. I think I’ll make this but put it over some yummy whole wheat pasta…I think farfalle would be a great option! I have been making both these dishes for years. Except for the spring mix part. Usually just throwing in spinach, kale or chard. I often buy the large tub of spring mix on mark down but can’t always use it all at it’s freshest. This is great and will be trying it soon. Also I have never heard anyone say or write out loud they like left over soup for breakfast, but I do. Fast, warm and satisfying. Leftover soup for breakfast is so good! And so easy. All you have to do is reheat it! 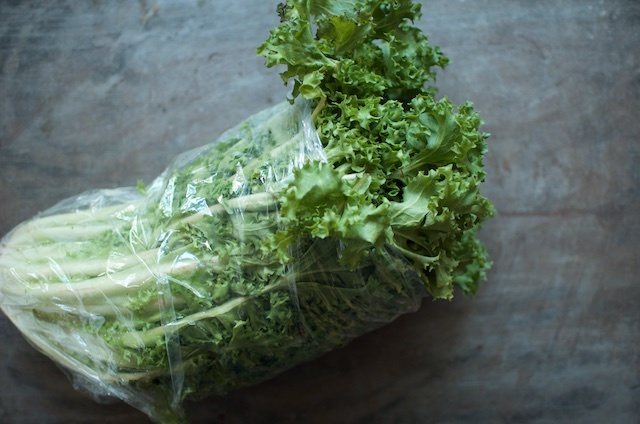 that is my preferred method of cooking greens – as my mom did, and as my nonna did. we call that ‘minestre’ – food that is ‘wet’ – but not soup. as my nonna would say, it was not good for your health to always eat ‘dry’ food. beans and greens? I could live on that for the rest of my days!